The XP-CPRO2L lift access controller can be used to control the access to the levels in the building. It uses the Mio-R16 to control the access to each of the floor. Each card holder is assigned with a floor zone setting which contains the information of how he/she can access to each of the level. You may configure that the card holder only able to access to a certain levels but denied entry into others. 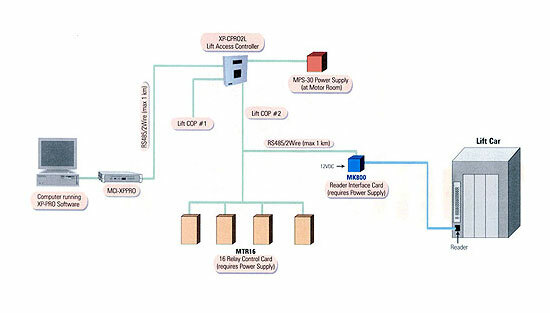 The XP-CPRO2L lift access control system can be used together with other MicroEngine’s door access equipments under the management of a single software system – xPortal2007 or xPortalNet. In this way, the accessibility of the card holder into each of the area including the control inside the lift can be managed from a single point. 1. I want to configure Lift Floor Access using XP-SNET. How to configure the setup?